The boohoo app is the easiest way to shop for affordable fashion onthe go. Whether you want to shop exclusive offers or are justlooking for inspo, 1000s of you already downloaded the app to feedyour shopping addiction. We’ve got you covered: the app puts theentire boohoo range at your fingertips - dresses, accessories,heels & coats, men's shirts and much more!We’re adding hundredsof banging styles every day, and now you can have them all in yourpocket. Check out the features: √ Access exclusive promotionaloffers and discounts. √ Stores your information for a super-fastcheck out. √ Easy to navigate the entire boohoo rangeCheck out whatsome of you are saying about the app: ▶ "Dangerously easy to use! "▶ "I have always loved boohoo, the app just makes it even better" ▶"It's just too simple to buy stuff"
Shop the latest drops of what's hot and just landed straight fromyour phone! 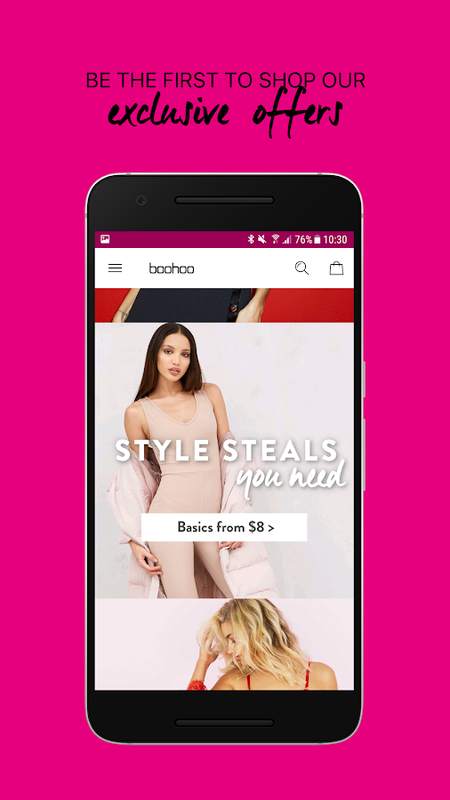 With the boohoo MENA app, you'll never miss out on newaffordable fashion again. We add hundreds of new sizzling stylesevery single day. You can order straight from our app, or saveitems to lust after later on any device. Use the app to order yourmust-have essentials, treat yourself to a weekend outfit or justfor some inspo. Spend less time on the boring stuff and get yourclothes with speed and ease with our brand new checkout. This is24/7 fashion at its best #weareboohoo. Discover the new season'sneed-right-now threads with the new boohooMAN . Browse and shopover two hundred new styles arriving every week with the bestoffers to stay on top of your game. You can shop on the go with ourfast and secure checkout or save your items for later in your wishlist across any device. Use the app to shop the latest boohooMANedits of the toughest trends around, we’ve got key pieces that’llgive your style an instant update. Download the app to shop theentire Boohoomena collection and enjoy these perks: • Choosing yourpreferred payment options: cash on delivery, credit card, orPayPal. • Free return within 5 days • Sale alerts and promotionalnudges, so you always stay up to date • Delivery to Bahrain,Jordan, KSA, Kuwait, Oman, Qatar, and the UAE. • Access to theentire collection on the Boohoomena site; shoes, dresses, partydresses, tops, jumpsuits, swimwear, accessories • The Wishlist soyou can add all your favorites to buy later • Super quick and easycheckout and pay option • In-app currency switcher • Chatting withan Arabic or English speaking customer service representativeavailable 7 days a week from 6am to 4 pm UK time. The new UO app brings the best of Urban Outfitters to your mobiledevice: - Shop — Find the newest arrivals, exclusive collectionsand more. Explore our expanded product assortment with enhancedsearch and express checkout. - Wish Lists — Create, customize andshare up to 5 UO Wish Lists. - UO Rewards — Get special offers,earn exclusive rewards and enter to win one-of-a-kind prizes as aUO Rewards member. - @urbanoutfitters — Get real-time inspo fromour @urbanoutfitters community. - Find a Store — Locate andbookmark nearby UO stores. - Order History — Keep track of yourorders, get delivery details, access previous purchases and more. With RoseGal app, you can shop any merchandise you like at anytimeand anywhere. You can also interact with over 10,000,000+ fans toshare your shopping experience. Keep your fingers on the pulse& gain inexpensive products. Main features about RoseGal app: - App exclusive deals price: single product up to $5 off - New users gift: first order 10% off coupon and 20 R pointsfor downloading Rosegal app and register - Order bonus: 10% offcoupon will be given for each paid order - Style Gallery: shareyour shopping experience, win opportunity to get up to 500 R points(worth 10 US dollars ) - Check-in activity: sign in to get 10R points per day. Sign in consecutively to win 500 R points (worthUS$ 10) and US$ 5 cash coupon - App-Only product: some products areonly available on app Key facts about RoseGal: - FastFREE flat rate shipping worldwide - Over 200+ daily newarrivals - 7/24 after-sales customer service and live chat service - Ultra-low-priced products, the average product price isless than US$20 Whether you are looking for a perfect outfit for adate, a casual look in your daily life or a vintage style to showyourself, RoseGal online shop, a fast growing global online fashionstore, can offer you hundreds of styles of the best Women’s andMen's fashion, plus size, dresses, swimwear, bikini, tops, Americanflag, lingerie, leggings, bras, underwear, shoes, sandals, flats,led shoes, hair, bags, hats, beauty, sunglasses, watches, jewelry,keyring, rings, earrings, body jewelry, Men’s clothing, shorts,shirts, pants, jeans, blazers, tie dye, and so on to choose from,even a home decor or a fidget spinner to create a warm homeatmosphere. With thousands of iconic styles, vintage clothing, andaffordable product lines, we are confident you will find yourunique fashion product to add to your wardrobe. Choose an outfityou like, not just one that fits your budget. RoseGal provides allusers with more cost-effective goods. Download our app and becomeour user, RoseGal will impress you!